The Habitrail® OVO Studio Habitat allows you to design the living environment for your hamster – you can create up to 4 different design possibilities. The OVO Studio has more room to let your hamster roam to the different hideaways. 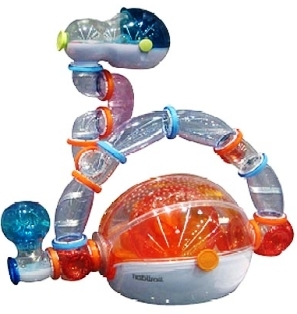 Your hamster can choose from many locations to snooze, hide, play and jet up for a quick snack in his cozy Mini Maze. • High molded walls to keep your hamster's bedding inside his home, and not all over your table or floor.